I guess the three run lead that Jose Valverde gave up against the A's in Game Four of the ALDS just wasn't good enough for him. Either that, or, Jim Leyland has given up on cigarettes giving him a heart attack. Of course, you would think that a four run lead is safe wouldn't you? Of course you would. Even with his struggles this year, Valverde is still a "proven closer," and, he is Leyland's guy. So the old man did what he did all year, he brought in Papa Grande to close out the ninth. And for that, baseball fans who don't have emotional interest in this game thank you Mr. Leyland. 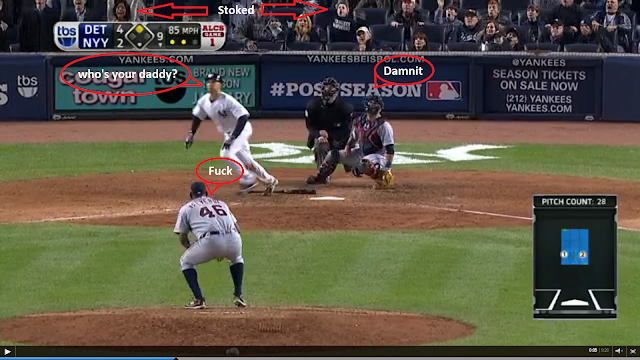 That right there folks, is that exact moment when Jose Valverde (and the two fans in the second row) crapped his pants. Thank you Jim Leyland. Thank you.